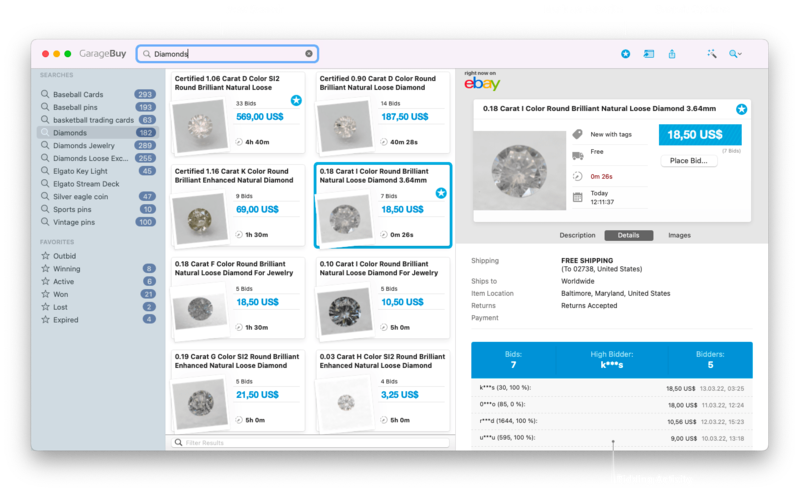 Setup sophisticated searches and find your favorite items in every nook and cranny of the eBay system. Easily fine-tune your searches to get the best results. Of course, GarageBuy automatically saves the search settings for you. GarageBuy remembers which items you already looked at. The smart auto-read feature marks listings as read while you scroll and in addition it can hide listings you already looked at from search result. The perfect eBay browsing experience! For each search, GarageBuy will show the number of the auctions you haven't viewed yet. Also, you can hide items you don't want to see. 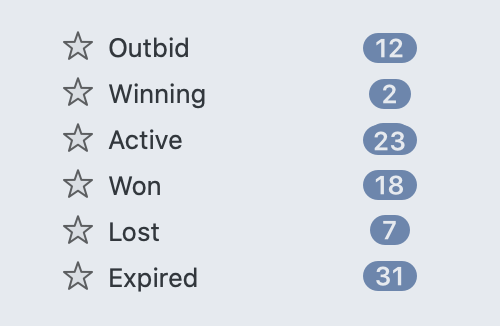 When you are bidding on an auction that has reached its final phase, GarageBuy will update the current bid, including the highest bidder's name, every few seconds automatically. That means you don't need to hit your browser's reload button until your thumbs bleed. Check how your favorite items are doing. Watched and previously bought items will be imported from My eBay. Find the iPad/iPhone version of GarageBuy here: GarageBuy for iOS. If you use GarageBuy's push notifications feature you'll get notified when a listing ends or if you've been outbid. Use all your eBay accounts in GarageBuy! Add as many eBay accounts as you want in the preferences. Whenever you bid on an auction or purchase an item you can choose your desired account. 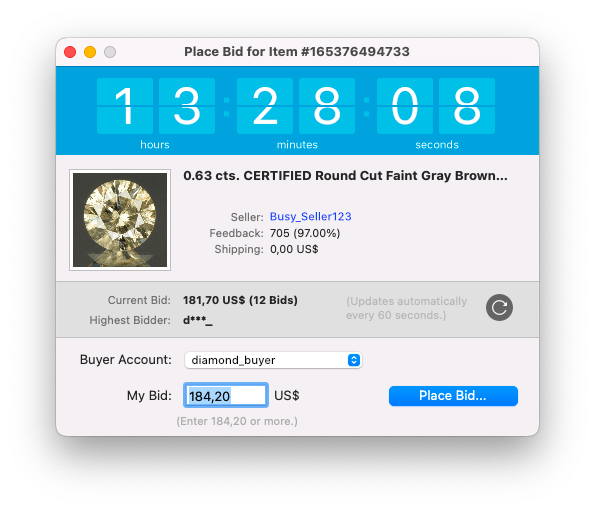 GarageBuy is the first Mac desktop application officially certified by eBay for bidding and purchasing items on its auctioning platform. 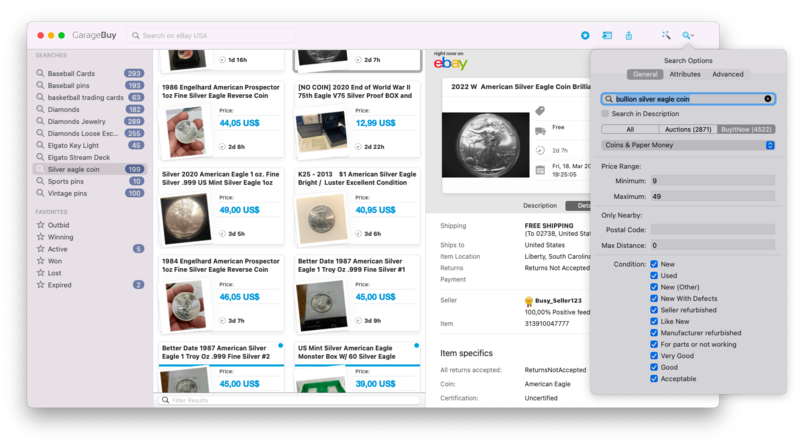 GarageBuy uses eBay's newest and most flexible programming interface the Finding API to stay compatible with everything that eBay has to offer.